Manuscripts started to become popular in Europe beginning, roughly, in the 8th century AD. (An example of an 8th century Irish manuscript, courtesy of the Bodleian Library, is available below). 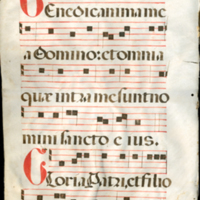 Used mostly for religous purposes by the church and its adherents, the most common types of manuscripts were bibles, books of hours, and other liturgical texts. Due to several factors, not all manuscripts survive intact into the present day; sometimes only a page survives, as is the case here at WestConn. But how much can we learn from a single page from a medieval manuscript? The short answer: more than I thought. The long answer: There are some basic methods that can be utilized for document identification in general. To investigate our specific leaf, we knew that there were some things the physical object could tell us, other things that we could infer or suppose, and other things we may never know for sure.